Fourier Transform Mid- and Far-infrared (FTIR) vacuum spectrometer, Bruker IFS 113v. Spectral range 30-4500 cm-1. Mid- and Far-infrared FTIR vacuum spectrometer, Bruker Vertex 80v. Spectral range 20-6000 cm-1. The two Bruker vacuum FTIR systems, Vertex 80v (left) and IFS 113v (right). Mid- infrared FTIR spectrometer Bruker Equinox 55 equipped with Attenuated Total Reflectance (ATR) accessory and coupled to an infrared Bruker Hyperion 2000 xyz stage microscope. Spectral range 400-6000 cm-1. Close-up to the Mid-IR system, shown here with the ATR accessory fitted additionally with a gas cell. Spectral range 650-6000 cm-1. Close-up to the liquid N2 cooled MCT detector Bruker Hyperion 2000 infra-red microscope with LCD screen and eyepieces, connected to the Bruker Equinox 55 system. Near-infrared (ΝΙR) FTNIR spectrometer, Bruker Vector 22N, including integrating sphere and optic fibre sampling accessories. Spectral range 4000-14000 cm-1. 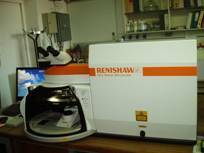 Dispersive confocal Raman microscope, Renishaw inVia Reflex with 4 laser lines (488, 514, 633 and 785 nm). Spectral range 100- 4000 cm-1 (depending on excitation line), resolution ~1.0 cm-1 (depending on excitation line), NExT filter (488, 514, 633 nm) for work in the range ~15-500 cm-1. 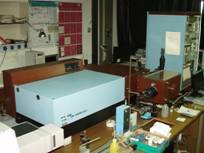 Dispersive Raman spectrometer coupled to a microscope Jobin Yvon HG 2S. FT-Raman spectrometer Bruker, RFS 100 equipped with the Nd-YAG laser 1064 nm NIR line. Personal computers, spectroscopic software and a multitude of accessories, such as high and low temperature cells, high pressure cell, support the above instruments.